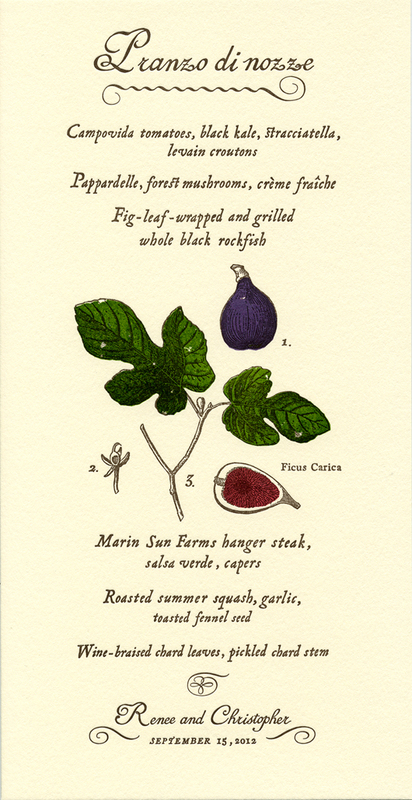 My mother just dropped off a bounty of delicious figs from her tree and it made me think of this menu that I created last year. Renee and Chris were a lovely couple getting married at Campovida, a magical family run organic farm and vineyard in Hopland, California. The Italian inspired wedding feast was served outdoors under the stars. As the menu featured fish grilled in fig leaves, and the tables had bowls of figs for guests to enjoy, we decided it would lovely to use an old botanical illustration of figs… it also added such beautiful fall colors to the tables. I hand-lettered the menu in a style inspired by early Italian typefaces. I silkscreen printed the colors of the botanical illustration and then letterpress printed the line work and wording. Simple, yet warm and elegant, they looked fantastic all lined up at each place setting down long family style tables. Molto Bello!